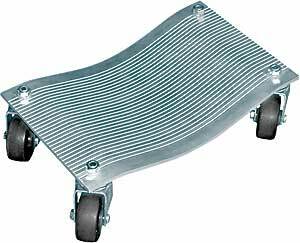 The Car Wheel Dolly was designed to assist in moving automobiles and heavy vehicles with ease! The wheel dollies are placed under the tires to move or turn any car or trailer in any direction. The grooved platform is constructed from durable 5/16" light weight aluminum and includes non-marking ball bearing swivel casters that move easily across the roughest surfaces. For Vehicles Under 4500 lbs. For Vehicles Under 6000 lbs.